M M MORRILL (1903) The 60 foot 43 ton sealing schooner M M Morill foundered June 30, 1903 along with the schooner James G Swan along the coast of Alaska. The vessel was built in Seattle in 1894. 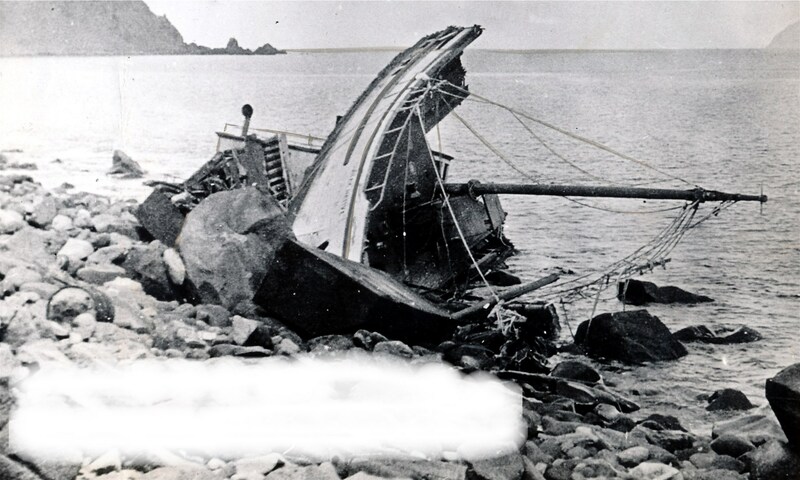 News of the wreck came from Kotzebue Sound and reported that the captain of the M M Morill, Louis F. Bernhardt, was drowned when the ship was lost. The rest of the crew is reported to have survived. M T B S INC V (1955) The 45 ton 50 foot wooden freight barge M T B S Inc V stranded and was lost July 15, 1955 at Unalakleet. MABLE LANE (1898) The river steamer Mable Lane was lost in the Bering Sea July 17, 1898. She had departed Dutch Harbor bound for St Michael under tow of the vessel South Portland. The Mabel Lane’s tow line parted in a gale and she filled and sank. MALROE (1919) The 12 ton wooden schooner Malroe was destroyed by fire near Nome on Monday August 25, 1919. The vessel was out of commission and hauled out on the bank of the Snake River about a half mile from the mouth. The cause of the fire was unknown. The Malroe was valued at $400 and had no insurance. MARY MITCHELL (1851) The 354 ton whaling ship Mary Mitchell was stove in by ice and lost in the Bering Sea 30 miles northwest of King Island on July 1, 1851. Captain Sayer had brought the vessel up from San Francisco for whaling in the Arctic. She was valued at $22,000 with cargo. MASSACHUSETTS (1871) The 351 ton wooden ship Massachusetts was lost at Scammon’s Lagoon north of Cape Romanzoff February 6, 1871. The vessel’s home port was San Francisco and she was in service in the whaling trade. Her value at the time of the loss was $45,000 with cargo. The red barge Maude was valued at $5,000 at the time of the loss. The crew made it to safety but the barge and coal were lost with no insurance. The Maweema was valued at $11,000 at the time of the disaster. The entire crew survived. MILOS REEFER (1989) The 485 foot Greek refrigerated fish carrier Milos Reefer ran aground at Gloria of Russia Cape on St. Matthew Island November 14, 1989 with 27 crewmembers on board. All those aboard were transferred to a Polish ship which took them to Dutch Harbor. The Milos Reefer was owned by Transcontinental Maritime Trading of Piracus, Greece and had no cargo aboard at the time of the accident. She was carrying 258,000 gallons of fuel oil and 71,320 gallons of diesel oil and wrecked within the Bering Sea National Wildlife Refuge. 237,343 gallons of fuel and oil were reported to have leaked into the marine environment by November 28, 1989. MINERVA (1898) The barge Minerva was lost at the mouth of the Kuskokwim River June 28, 1898. She had departed Seattle May 31, 1898 being towed by the steamer Jessie along with a second unnamed steel barge. There three vessels were lost in the turbulent waters outside the Kuskokwim River. Also lost were the crews and miners from the Columbia Exploration Company that were aboard; a total of 18 souls. One person, a trader called Ling, lived to tell the tale. He brought word of the wreck to Saint Michael. Many believed the surviving miners and crew were massacred by Indians who looted the wrecks. MOONLIGHT (1898) The 71 ton schooner Moonlight ran aground on a small island 20 miles from the Kobuk River Mouth and was lost July 2, 1898. It was reported that the captain refused to use Indian Guides as Pilots. There were 42 passengers aboard bound for Kotzbue Sound from Seattle. “Crew and prospectors built a small boat from lumber on board and continued prospecting.” Much of the cargo of prospecting outfits, provisions and lumber was salvaged.